Do you want to hang out in one of the most famous hostel bars, including an indoor smoking area with pillow stage? The Flying Pig Downtown is the place to be, located right next to Central Station. We have dorms where every bed has a reading light, as well as private rooms with a little fridge and TV. Rates include free linen. There are single and queen-size bunk beds as well as a shower and toilet in most of the rooms. There are also free individual lockers in the rooms; bring your own padlock or buy one at reception for just 3 euro. The Flying Pig Downtown provides a free buffet-style breakfast, free use of the guest kitchen, luggage storage, free Wi-Fi, a book exchange, munchy food for sale and a lively hostel bar with DJ nights and the cheapest beer in town. Meeting people is very easy at this hostel while chilling on lounge pillows in the smoking area, drinking and playing pool in the bar, dancing to the music of local DJs and cooking meals in the guest kitchen. If youâ€™re in the 'don't-want-to-mingle-tonight-and-just-want-to-watch-television mood there are DVD for rent. The bar is open until 3am every night, where the bartenders sell the cheapest beers in town!! Weâ€™re open 24hrs with night security and keycard access and thereâ€™s no curfew or lock-out. You can use the safe behind reception to store small valuables. Our reception also sells tickets to several events and places and Pig merchandise. Thereâ€™s a shuttle bus service between Amsterdam and the Beach hostel. Our friendly staff also has free walking tours, a daily updated Amsterdam agenda, a free detailed map of Amsterdam and discounts on several things to do in the city. You also get 50% off entrance to Winston Kingdom club with your Flying Pig key card! Leaving the Central Station, it is just a five-minute walk to the hostel and during this walk youll already see the many restaurants, pubs, red lights of the famous Red Light District and shops. Thats the party area where youll be spending your nights. The hostel entrance is in Amsterdam's busiest shopping street and it is a perfect place to kick-start your night of club-, pub- and coffeeshop-hopping. 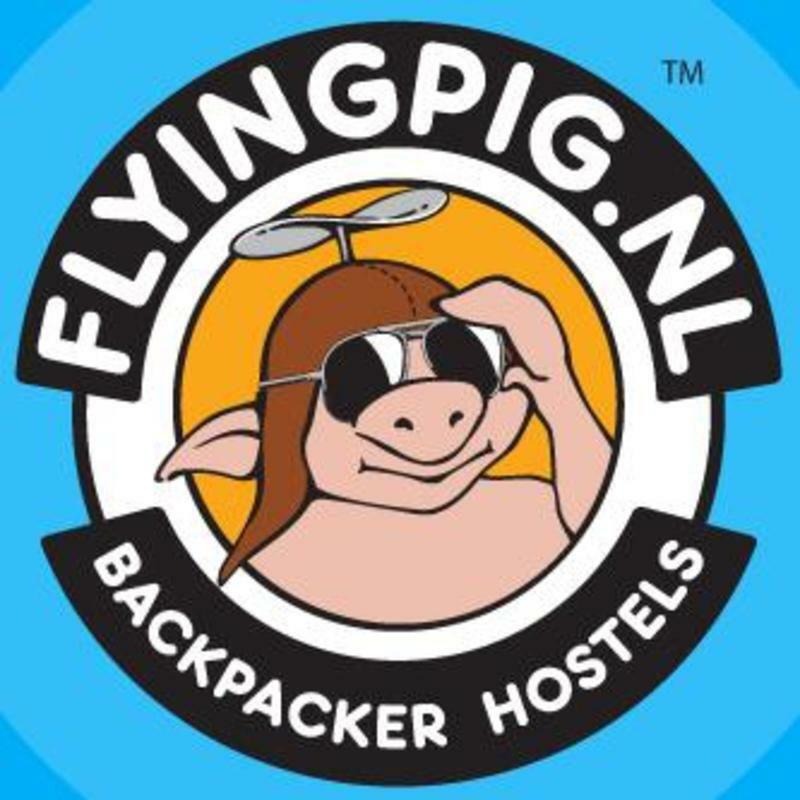 Besides everything the hostel offers you, our international Piggie staff can provide you with all the information you need to get the most out of the Amsterdam experience. Close to our hostel you will find the Red Light District with its famous windows. Itâ€™s very safe to walk around here and a good place to hang out when the night falls. Thereâ€™s also Anne Frank House which brings you back to the time of the Second World War. In this house Anne Frank and her family hid away for years, before being deported to the concentration camp. The Royal Palace is good, too, with its spectacular 16th-century halls and rooms, and Dam Square with its musical groups, performers and other entertainers. And donâ€™t forget one price covers all! The easiest way into Amsterdam from Schiphol Airport is by train. Trains between Schiphol and Centraal Station depart about every 10 minutes between 6am and 1am, and once every hour between 1am and 6am. A one-way ticket will cost you 3.20 from a vending machine, you will need some coins though. Trains to Amsterdam Centraal Station generally depart from platform 1 or 2. From the main entrance you walk towards the Damrak. Pass the Victoria Hotel. Take the first alley on your right until you reach the end which is Nieuwendijk. We're at number 100 .